We take the safety of all our staff and customers very seriously. 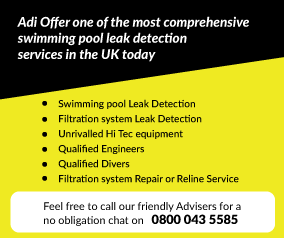 ADI Leak Detection has Public Liability Insurance for up to £5,000,000. Risk Assessments and method statements can be provided for every job, whether domestic or commercial. All our divers are certified to a minimum level of PADI Advanced Open Water. Every team we send out will include at least one certified PADI Rescue Diver – trained to identify and deal with any potential dive-related emergency before it happens. This gives you, the customer, the peace of mind that all work will be carried out in a safe and professional manner and well within recommended safety guidelines. Please call us today on 0800 043 5585 to discover how we can help you locate your swimming pool leak and / or repair your swimming pool leak!